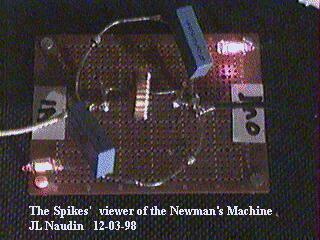 12-02-98 - Demonstration of the Self-Running Newman's Machine. 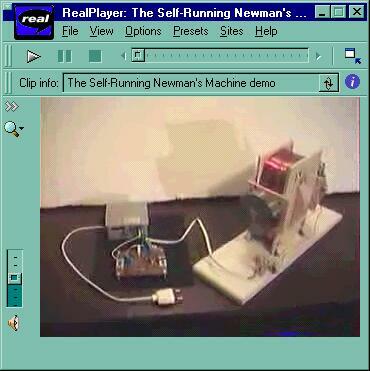 If you have already installed the ReaVideo player (tm), fasten your seat belts and watch the self-running demo video of the Newman's Machine v2.0. The Newman's Machine speed was about 330RPM, without mechanical load on the shaft, the electrical power input needed was about 210 mW. This is the power needed for overcoming the mechanical frictions and the Joule's losses. This has been mesured during the previous test report ( on 11-22-98 ). The self-running time during the demo was about 5 minutes. You may notice that the power supply uses two 160uF capacitors in series, thus this give a 80uF capacitance at 620 Volts. This give a stored energy in the capacitors (C1,C2): W = 0.5 * 80e-6 * ( 620 ^ 2 ) = 15.3 Joules. When I have disconnected the 220 Vac input, the Newman's Machine had only 15.3 Joules of energy for running itself. I have previously measured that, the power needed for overcoming the mechanical losses and Joules losses was 210 mW, with the neon bulbs this give about 220mW of electrical power. So, this give a calculated working time of T= W / P = 15.3 / 0.22 = 70 seconds. 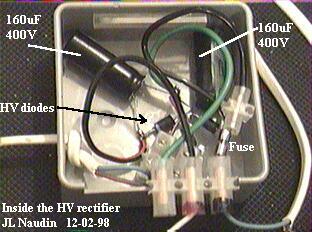 This mean that after 70 seconds the capacitors voltage has dropped to 0 Volt ( this is not the case in this test). The diagram below shows the record of the voltage with respect to time of the power supply during the self-running test. You may notice that the Newman's Machines has stopped at 45 volts and after 5 minutes of self-running. If there is no voltage in the power supply and that the Newman's machine has been previously set at the same rotation speed, the time needed to stop completly was 30 seconds.